There is currently no evidence that smoking tobacco products can, on its own, cause mesothelioma. Instead, mesothelioma is most often caused by asbestos exposure, and more rarely it is caused by other factors such as radiation or exposure to the SV40 virus. While smoking does not cause mesothelioma, smokers who are exposed to asbestos may be more likely to develop mesothelioma than non-smokers. Smoking irritates air passages. This can make it more difficult for the lungs to self-cleanse, and asbestos fibers may stay in the lungs longer. 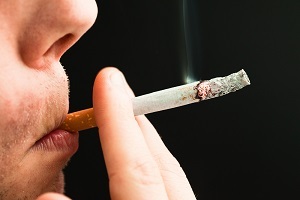 Smoking weakens lung tissue. This may allow asbestos fibers to lodge more easily in lung tissue. Smoking can cause health complications that make fighting mesothelioma harder. Smoking is a leading cause of lung cancer and other health complications. If you suffer from poor health, then it can be more difficult to recover from mesothelioma or to endure the harsh cancer treatments for mesothelioma. For these reasons, it is important to let your doctors know that you are—or that you were—a smoker. It wasn’t tobacco products that caused you to develop this aggressive form of cancer. Instead, it was likely your work with asbestos, which may have happened decades ago. Our experienced mesothelioma lawyers know how to investigate mesothelioma cases and fight for the fair damages that mesothelioma victims, and their families, deserve. We are committed to your fair recovery, and we will not be paid until your case is settled. To learn more, please contact us online or call us directly at 318.588.6303 to schedule a free, no-obligation consultation. Let’s talk about your legal rights and about what we can do to get you the fair recovery that you deserve.